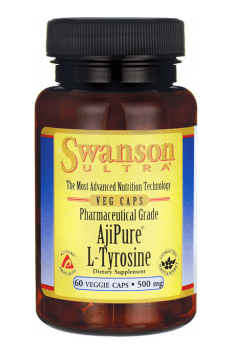 Swanson AjiPure L-Tyrosine is a dietary supplement providing 500 mg of amino acid L-tyrosine in one vegan capsule. The preparation is based on an innovative method AjiPure®, patented by a Japanese company Ajinomoto, taking advantage of the process of fermentation of natural materials. This method guarantees almost 100% purity of amino acids. L-tyrosine is classified to endogenous amino acids, i.e. the organism can produce them on its own. A certain amount of this amino acid is synthesized in the organism from phenylalanine, but to a largest extent, the need for tyrosine is covered by a diet and proper supplementation. Due to its pleiotropic activity and participation in very important metabolic transformations, it is worth taking care of the level of L-tyrosine in the organism. L-tyrosine takes part in the biosynthesis of the main catecholamines present in the organism - adrenaline, noradrenaline and dopamine. These neurotransmitters are produced as a result of hydroxylation and decarboxylation of tyrosine. Therefore, the supply of the proper amount of the precursor conditions optimal synthesis of neurotransmitters, which contributes to maintaining balance in the nervous system. Adrenaline, noradrenaline and dopamine belong to excitatory neurotransmitters. Adrenaline increases motivation, concentration, energy level and causes stimulation. Its low level may be manifested in fatigue and difficulty in losing weight. Noradrenaline is essential to maintain emotional stability, it is also vital in processing memory traces. Dopamine stimulates the reward system in the brain, conditioning the feeling of satisfaction and pleasure and moreover, it causes the growth of motivation and its deficiency may predispose to increased susceptibility to addictions. L-tyrosine, by taking part in the process of melanogenesis, is a precursor of melanin - a natural pigment of skin, eyes and hair. L-tyrosine is a key substrate in the first phase of melanogenesis, where it it transformed to DOPAchinone, which is subjected to further biochemical changes. Melanin constitutes a group of multimolecular pigments. In this group we may differentiate eumelanin and pheomelanin. Eumelanin, thanks to the ability to absorb UV radiation demonstrates photoprotective effect. Apart from this, it may neutralize free radicals and reactive oxygen species (ROS). L-tyrosine may be helpful in hypothyroidism. Deficiency of thyroid hormones is the cause of hypothyroidism and Hashimoto disease. These hormones, by their influence on the metabolism of the organism and calcium-phosphorus balance, regulate many important processes in the organism. Their deficiency results in slowing down these processes, which is manifested in permanent fatigue, increase of body mass, nervous system disorders or problems with getting pregnant. L-tyrosine binds with atomic iodine, constituting a precursor for the synthesis of thyroid hormones. In this way, it contributes to the increase of the level of these hormones in the organism. L-tyrosine deficiency may deepen the state of hypothyroidism. To sum up, Swanson AjiPure L-Tyrosine is a high-quality dietary supplement, providing the amino acid, which is essential for the proper functioning of the organism. The preparation is especially recommended as support in the therapy of hypothyroidism, in the period of increased physical and intellectual effort, in energy drops and difficulties with concentration.